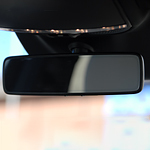 An auto-dimming rearview mirror is an invaluable feature in any vehicle. These mirrors use a process called electrochromism to reduce glare from the headlights of approaching vehicles by darkening the mirror. Mirrors with this feature are equipped with specially designed ambient light sensors that work to detect glare from headlights. The electrochromic gel is then used to communicate and send the appropriate charge. This process then reduces the amount of light that the oncoming vehicle is able to reflect onto the driver's face. By reducing this glare, the driver does not have to worry about impaired vision leading to a reduction in visibility. The friendly and expert associates at Wine Automotive can help explain to you exactly how these rearview mirrors work and how they can help you to remain as safe as possible on the road. We welcome the opportunity to serve you and all of your automotive needs!